I've always wanted to make Chinese marbled tea eggs but have been put off by having to simmer the eggs on the stove for a couple of hours. 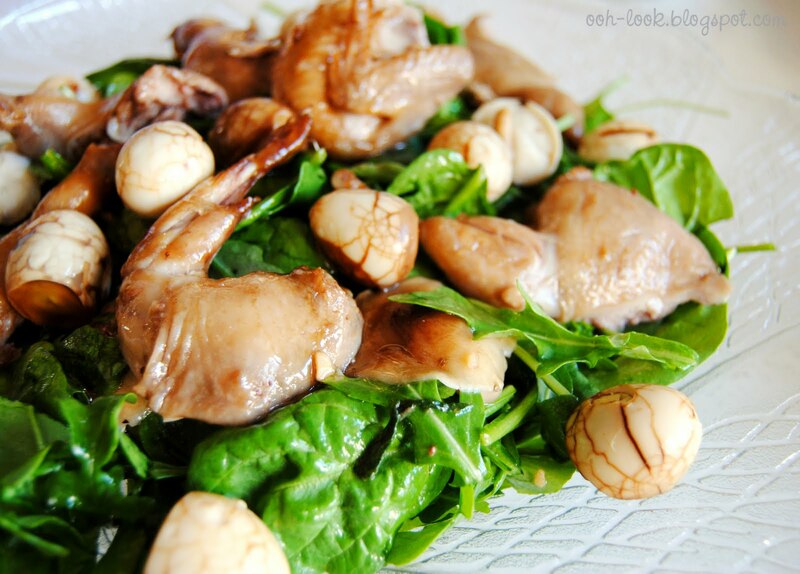 This is an easier alternative that uses quail eggs. At least, my (inaccurate) thinking was that the smaller eggs would be simpler to cook. Go fig! 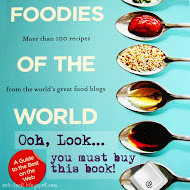 But where do you get quail eggs? A great suggestion was from Asian butchers (thanks, @yygal!). As it turned out, on the day I wanted to make this dish, I visited the Good Living Growers' Market at Pyrmont, and they had a whole tray of beautifully specked eggs for $5, which I bought. 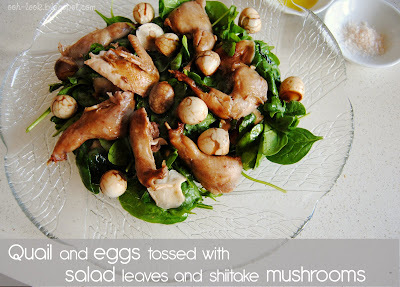 Together with some quail for David Jones, they ended up in this salad of Quail with Marbled Quail Eggs. The recipe is from delicious magazine, though I've modified it slightly below to allow the quails to cook a bit more. 1. Place eggs in a saucepan of cold water and bring to the boil. Reduce heat and simmer for 7 minutes. Drain and cool slightly. Tap the shells all over with a spoon until they are all cracked, but do not peel. The more cracking, the more marbling later. 2. Place the unpeeled eggs, salt, soy sauces, 4 star anise and teabags into a saucepan and cover the eggs with cold water. Bring to the boil. Reduce heat to low and simmer for 2 hours (top up with water if necessary). Cool, then transfer mixture to a bowl and refrigerate for at least 8 hours. 3. 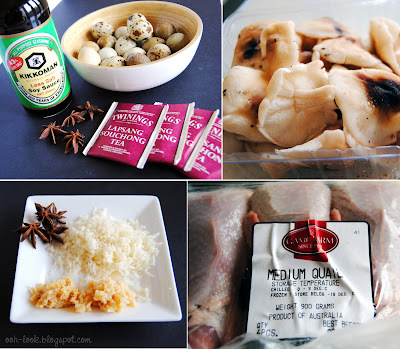 For the quail: Place remaining soy sauce, 2 star anise, sugar, ginger, garlic, wine and 1 litre of water into a large frypan. Bring to the boil, then reduce heat to low and simmer for 1 hour. Add quail and return to the boil. Turn the quail to cook through (juices should run clear when they are just cooked). Cool in the liquid. [The quail and eggs can be prepared to this stage the day before]. 4. To make the dressing: place palm sugar and 1/4 cup of water in a small saucepan over medium heat, stirring to dissolve the sugar. Increase the heatto high and cook until reduced by half, then set aside to cool. Add the remaining dressing ingredients and whisk to combine. 5. Now you need to roast the quail: bring the quail to room temperature, then toss with the shiitake mushrooms in the oil. Place the quails on a baking tray in a pre-heated 200 deg C oven and cook for 10 minutes (you may want to cover the leg tips in foil to prevent browning too much). Remove from oven to rest. Then carve each quail into 4 joints. 6. Roast shiitake mushrooms in the oven for 5 minutes. 7. Peel the quail eggs. 8. Toss the salad leaves, quail, mushrooms and eggs in a large bowl. Pour over the dressing. Serve on a platter. Ingredients: Soy sauce, quail eggs, star anise, lapsang souchoung teabags, shiitake mushrooms, grated palm sugar, minced ginger, minced garlic, quail. The eggs are hardboiled first, then the shells are cracked before simmering in the soy, star anise and tea. If you use teabags, don't do what I did and hang the teabag tags over the edge of the pan - mine caught fire when I turned up the heat - oops! ...You will need to use your fingers to eat the delicious quail. The meat has a wonderful flavour from the soy, and the marbled eggs have a smoky, salty flavour as well. I love marbled eggs because they look so beautiful like little precious pebbles! :) Nice. That looks very tasty. I adore Chinese-style braising, eggs and quails, and your dish combines them all! OMG this looks amazing! Those eggs came up really well. Delicious! Super impressive dish, Belle! I do love some good finger bowl action. Oh I'm jealous of your burning tea bags. I would be hard pressed to burn anything with my stupid electric stovetop. Super duper cute! Quail eggs are so pretty - love that first shot of them with the star anise. WOW! Look at the eggs! Phantastic! Perfect for when you find 1 chicken tea egg too much to eat, love the mother and son concept with the quail breast salad! Definitely on my to try list. The marbled eggs look gorgeous, and the salty-smokey tea flavour sounds divine. I love marbled eggs cos they look so pretty. I think it looks more beautiful with quail eggs. Fabulous to use in salad. Thanks for sharing. Haha, thanks for sharing your mini-fire incident with the teabags as I'm sure I would have done the same! I've never thought of tea quail eggs, but the results look scrumptious! This salad looks really really good! 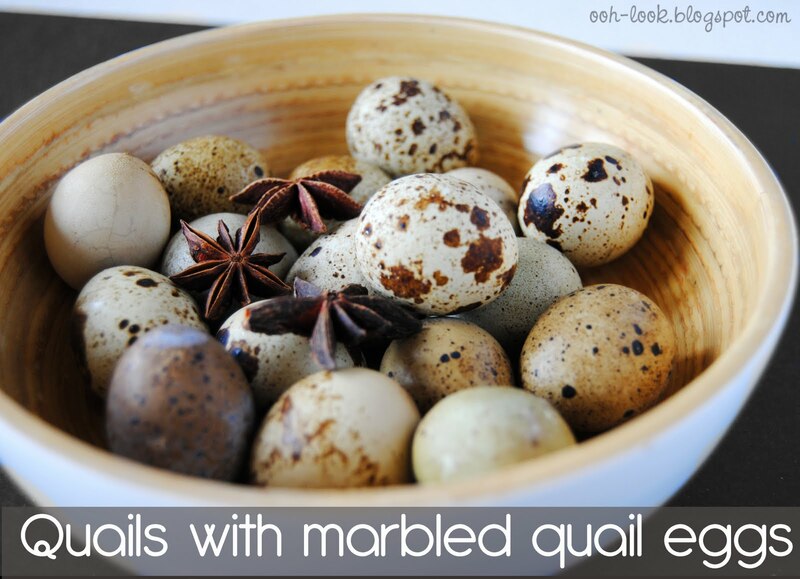 Love quail and quail eggs! What an incredible looking dish! this dish is so pretty! I love that marbled effect on the eggs. I've always wanted to try it too. I love that you managed to incorporate danger into the recipe and started your own little fire!! "Quick call a spunky fireman to put out my fire!!" Woah this looks sooo yummy! Those little quail morsels look so tempting!